Our families say the nicest things! I just wanted to say a sincere heartfelt thank you for making food accommodations for my son. I know that Kidco advertises the ability to adjust meals for those kids with food allergies but you have gone above and beyond for my son. I know how hard it is to find things he can and will eat. I have to make most things from scratch and it pains me to see him upset that he cannot have the cookies or the muffins that other kids have. The fact that you have gone out of your way to look up different recipes to make something he can eat (instead of rice cakes every day for snack!) is amazing. He loves your smoothies and energy bites! It's nice to know he has someone other than his own family who is looking out for him. Kids & Company has done a great job catering to all of my child's allergies needs! I have always felt safe having my children in Kids & Company care and the substitutions have been outstanding! Kids & Company has played a vital role in our journey of parenthood. We were on a search for a "top notch" daycare when our youngest daughter, Lily, was diagnosed with hip dysphasia. After her first surgery at 4 months old, she was in a cast until she turned 1 year old. Lily started attending kids and company when she turned 1 and was just gaining strength in her legs and learning how to walk. The staff was very attentive to her needs and she started to walk at 14 months old, much sooner, than what doctors expected with her condition. We had complete confidence that our daughter was receiving the best care at kids and company; nothing beats the food that is provided which nourishes your child in a way that helps them to grow healthier and stronger every day! I was very impressed with the menu, especially with the variety of fresh fruit and vegetable and all the fun names. My son talks about "Monkey pudding" a lot and hummus with crackers. 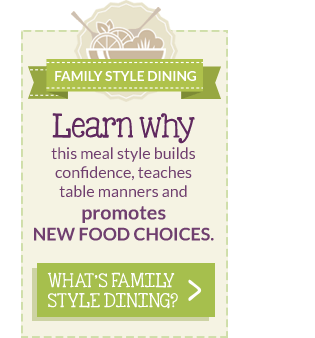 Thank you for making the menu a healthy one and introducing new things that parents don't offer their kids, because we know that the kids wouldn't eat them at home. But it's different when it's outside of home and they discover that salad isn't so bad. It supports my efforts at home to offer vegetables at each meal and healthy snacks. At home we talk about healthy foods a lot and it was great to see that your kitchen also offers the same. I am so happy to see how healthy the menu is! 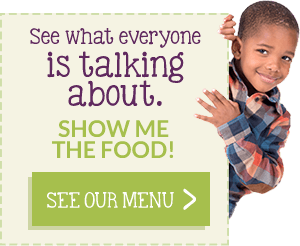 (it has helped my picky eater tremendously!) It is also such a selling feature for K+C. I remember looking at other daycares and their menu and the food definitely doesn't look like yours.